Artistic Concrete Floors LLC in Covington, LA. The Concrete Studio in Dallas, TX. Southern Textures in Lexington, SC. Stained Concrete Originals in Los Angeles, CA. Salzano Custom Concrete in Centreville, VA. 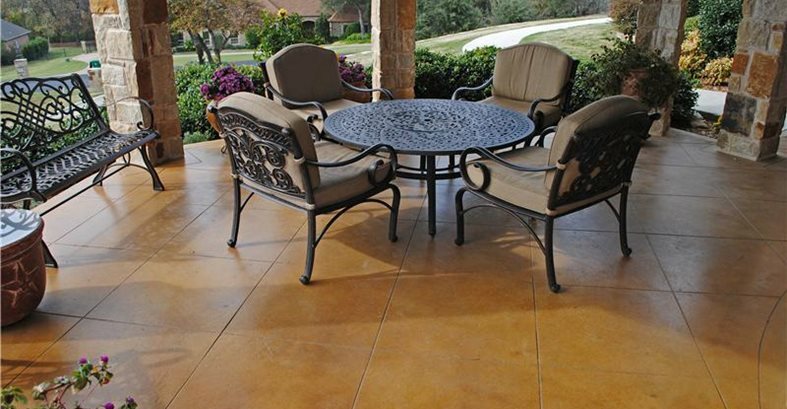 Remove Existing Stains FirstBecause concrete stains tend to be translucent in color rather than opaque, they won’t hide color variations or unwanted stains in existing concrete patios resulting from dirt, oil, grease, organic matter, or weather exposure. 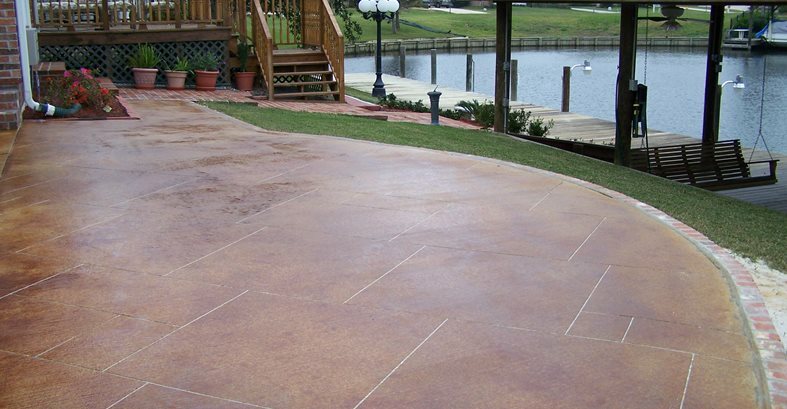 Staining is an economical and highly versatile way to upgrade the look of both new and existing concrete patios. With stains, you have the ability to add subtle hints of color, bolder design accents, and even custom graphics. What’s more, because concrete stains penetrate deeply into the concrete surface, they produce fade-resistant, permanent color. Unlike with a paint or coating, the color won't flake off or peel away. 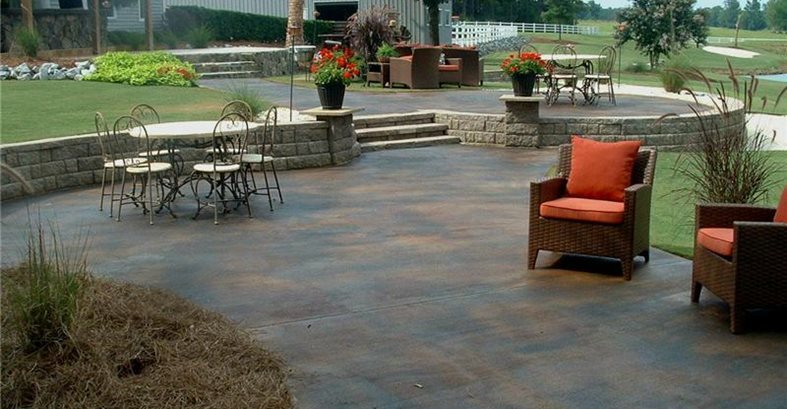 Depending on the look you want to achieve for your stained concrete patio, you can choose from acid-based chemical stains or water-based stains. Acid stains penetrate and react chemically with the concrete, creating natural color variations that add character and unique mottling effects. However, the color selection is generally limited to subtle earth tones, such as tans, browns, terra cottas, and soft blue-greens. 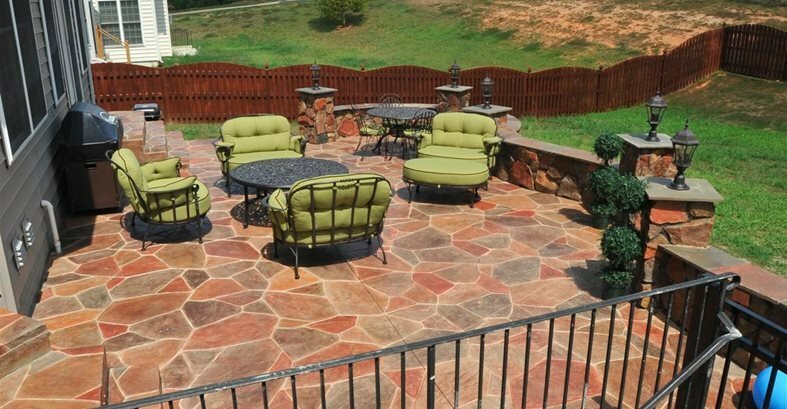 There are endless decorative effects you can achieve when using acid or water-based stains to spice up the look of your patio. Sometimes the best approach is to keep it simple, using just one stain color in a hue that will complement your home or landscape (see this example). Or you can be more daring and use multiple stain colors to create custom looks. Set off your patio by adding a stained border (see Colored Borders Add Decorative Touch to Concrete Patio). Apply multiple colors of stain to mimic the look of natural stone (see Concrete Patio Mimics Natural Stone). Make your patio look like marble (see this project). Use stencils along with stain to create custom graphics (see Custom Stencil Brightens Outdoor Patio). Use sawcuts and stain to create faux tile (see Custom Concrete Patio Exudes Simple, Clean Perfection). Adorn your patio with a vine design (see this project). 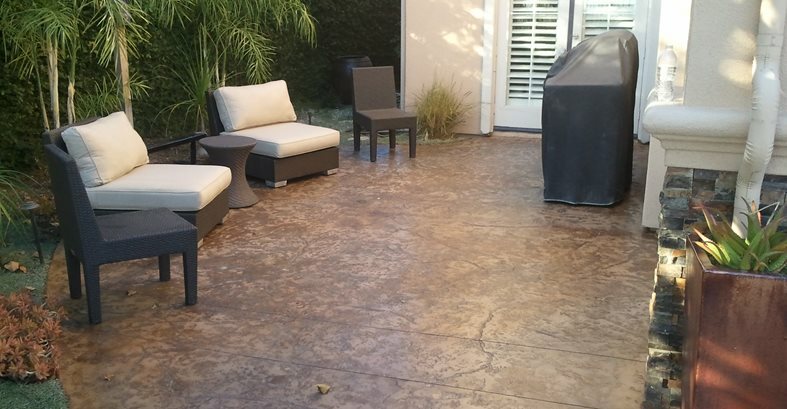 Bring your patio to life with an antiquing stain (see Concrete Patio Showcases Creative Staining). You can also use stains along with concrete dyes or integral color to create other unique decorative effects. Keep in mind that although staining is a comparatively low-cost finish option for a concrete patio, the final price tag of the project will increase if you want to use multiple stain colors, create custom graphics and faux finishes, or stain existing concrete that will need extensive cleaning and sealer removal. What Will I Pay for Stained Concrete?